Is My College Kid Covered By My Homeowners Insurance? Day 009 | Is My College Kid Covered By My Homeowners Insurance? It’s move-in day. Junior leaves for college. Wait…do you need to do anything special for his insurance? When it comes to your child’s possessions and liability, your homeowners insurance will extend to your child living on campus in a dorm. Typically 10% of your Personal Property coverage limit on your home insurance policy will extend to your child’s belongings in the dorm. So if you have $100,000 of Personal Property coverage on your homeowners policy, $10,000 would extend to your son or daughter. Should something happen to your child’s belongings they would be subject to your homeowners deductible. Your homeowners policy comes with Personal Liability. Most policies in Missouri come with a limit starting at $100,000. Your Personal Liability limits will also extend to your child living on campus. This provides protection for your child in the event he/she causes injury or property damage to a third-party. It will also provide defense costs up to the policy limit. If Junior lives off campus you will want to double-check with your insurance agent to see if your homeowners insurance will extend. The rules vary between insurance companies when it comes to this. In this case, he/she will want a renters insurance policy to provide coverage for their Personal Property and Liability. Any roommates will need a separate policy of their own. 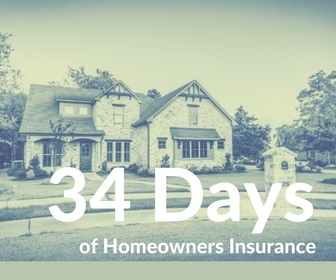 Need more 34 Days of Homeowners Insurance? It’s right here.